Nickname(s): "The Cowboy Capital of The World"; "The Wicked Little City"; "Queen of the Cowtowns"; "Bibulous Babylon of the Frontier"
Motto: "Get The Heck Into Dodge"
Buffalo Hunter Ralph Morrison who was killed and scalped December 7, 1868 near Fort Dodge Kansas by Cheyennes. Lt Reade of the 3rd Infantry and Chief of Scouts John O. Austin in background. Photograph by William S. Soule. The first settlement of non-indigenous people in the area that became Dodge City was Fort Mann. Built by civilians in 1847, Fort Mann was intended to provide protection for travelers on the Santa Fe Trail. Fort Mann collapsed in 1848 after an Indian attack. In 1850, the U.S. Army arrived to provide protection in the region and constructed Fort Atkinson on the old Fort Mann site. The army abandoned Fort Atkinson in 1853. 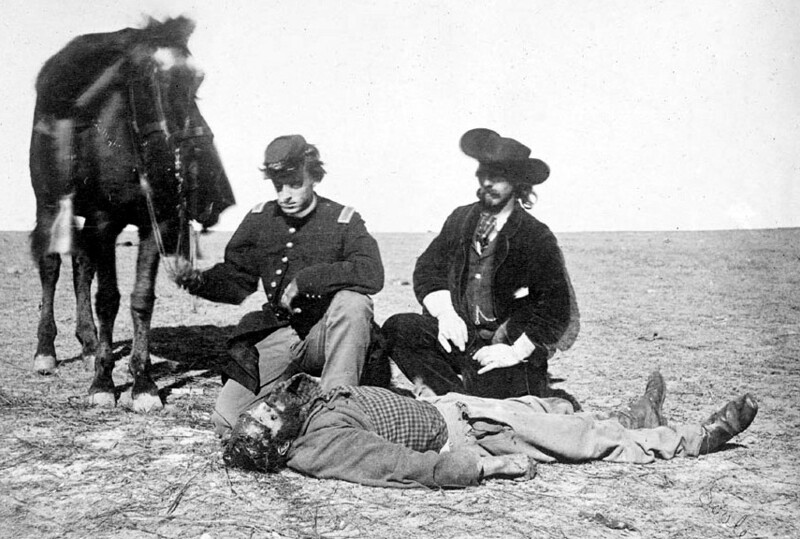 Military forces on the Santa Fe Trail were reestablished farther north and east at Fort Larned in 1859, but the area around what would become Dodge City remained vacant until the end of the Civil War in April 1865. In April 1865, as the Indian Wars in the West began heating up, the army constructed Fort Dodge to assist Fort Larned in providing protection on the Santa Fe Trail. Fort Dodge remained in operation until 1882. The town of Dodge City can trace its origins to 1871 when rancher Henry J. Sitler built a sod house west of Fort Dodge to oversee his cattle operations in the region. Conveniently located near the Santa Fe Trail and Arkansas River, Sitler's house quickly became a stopping point for travelers. 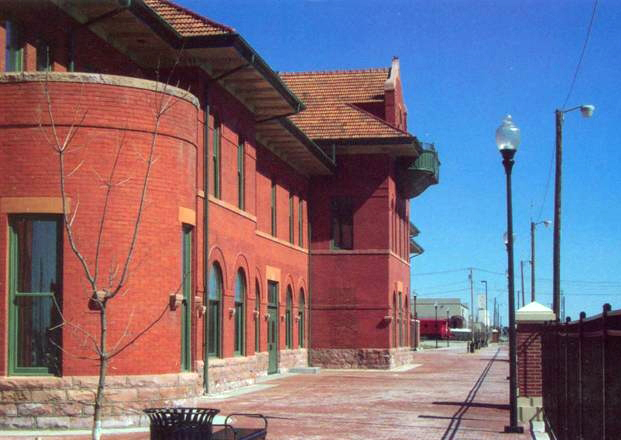 With the Santa Fe Railroad rapidly approaching from the east, others saw the commercial potential of the region. In 1872, Dodge City was staked out on the 100th Meridian and the legal Western boundary of the Fort Dodge reservation. The townsite was platted and George M. Hoover established the first bar in a tent to service thirsty soldiers from Fort Dodge. The railroad arrived in September to find a town ready and waiting for business. The early settlers in Dodge City traded in buffalo bones and hides and provided a civilian community for Fort Dodge. However, with the arrival of the railroad, Dodge City soon became involved in the cattle trade. The idea of driving Texas longhorn cattle from Texas to railheads in Kansas originated in the late 1850s but was cut short by the Civil War. In 1866, the first Texas cattle started arriving in Baxter Springs in southeastern Kansas by way of the Shawnee Trail. However, Texas longhorn cattle carried a tick that spread splenic fever, known locally as Texas Fever, among other breeds of cattle. Alarmed Kansas farmers persuaded the Kansas State Legislature to establish a quarantine line in central Kansas. The quarantine prohibited Texas longhorns from the heavily settled, eastern portion of the state. A new route, known as the Great Western Cattle Trail, or Western Trail, branched off from the Chisholm Trail to lead cattle into Dodge City. Dodge City became a boomtown, with thousands of cattle passing annually through its stockyards. The peak years of the cattle trade in Dodge City were from 1883 to 1884, and during that time the town grew tremendously. In 1880, Dodge City got a new competitor for the cattle trade from the border town of Caldwell. For a few years the competition between the towns was fierce, but there were enough cattle for both towns to prosper. Nevertheless, it was Dodge City that became famous, no town could match Dodge City's reputation as a true frontier settlement of the Old West. Dodge City had more famous (and infamous) gunfighters working at one time or another than any other town in the West, many of whom participated in the Dodge City War of 1883. It also boasted the usual array of saloons, gambling halls, and brothels, including the famous Long Branch Saloon and China Doll brothel. For a time in 1884, Dodge City even had a bullfighting ring where Mexican bullfighters would put on a show with specially chosen longhorn bulls. As more agricultural settlers moved into western Kansas, pressure on the Kansas State Legislature to do something about splenic fever increased. Consequently, in 1885 the quarantine line was extended across the state and the Western Trail was all but shut down. By 1886, the cowboys, saloon keepers, gamblers, and brothel owners moved west to greener pastures, and Dodge City became a sleepy little town much like other communities in western Kansas. Dodge City is located at 37°45′35″N 100°1′6″W﻿ / ﻿37.75972, -100.01833 (37.759671, −100.018212) at an elevation of 2,493 ft (760 m). It lies on the Arkansas River in the High Plains region of the Great Plains. The city sits above one of the world’s largest underground water systems, the Ogallala Aquifer, and is 25 miles (40 km) from the eastern edge of the Hugoton Natural Gas Area. Located at the intersection of U. S. Routes 50, 56 and 283 in southwestern Kansas, Dodge City is 151 mi (243 km) west of Wichita, 199 mi (320 km) northeast of Amarillo, and 301 mi (484 km) southeast of Denver. National Beef plant, 2006. Dodge City is an important center for meat packing. As of 2010, 70.9% of the population over the age of 16 was in the labor force. 0.3% was in the armed forces, and 70.5% was in the civilian labor force with 66.9% being employed and 3.6% unemployed. The composition, by occupation, of the employed civilian labor force was: 23.3% in management, business, science, and arts; 16.4% in sales and office occupations; 10.9% in service occupations; 15.2% in natural resources, construction, and maintenance; 34.2% in production, transportation, and material moving. The three industries employing the largest percentages of the working civilian labor force were: manufacturing (33.0%); educational services, health care, and social assistance (18.1%); and retail trade (9.4%). Cargill Meat Solutions and National Beef are the two largest employers with roughly 2,700 employees each. Other major employers include local government, schools, retail stores, and health care providers. Largest employers in Dodge City. Dodge City is a city of the first class with a commission-manager form of government. The city commission consists of five members who serve either two-year or four-year terms depending on the number of votes they receive. Every year, the commission selects one commissioner to serve as mayor and another to serve as vice-mayor. The commission meets on the first and third Monday of each month. Appointed by the commission, the city manager leads the city administration, executes the commission's policies, and develops operational programs to meet the city's needs. Dodge City Public Library, located north of downtown, is the city's main library. A member of the Southwest Kansas Library System, it has a collection of approximately 123,000 volumes, and it circulates more than 189,000 items annually. It was founded as a Carnegie library in 1905 and moved to its current facility in 1981. The library offers several services to the public, including computer classes, public internet access, and programs for children and adults. Other libraries in the city include the DCCC Library, which holds more than 30,000 volumes and serves as a federal depository library, and the Kansas Heritage Center, a non-profit resource center and research library operated by Dodge City Public Schools dedicated to the history of Kansas, the Great Plains, and the Old West. Originally a stop on the Santa Fe Trail, Dodge City was later located on the National Old Trails Road, also known as the Ocean-to-Ocean Highway, which followed the trail's path in western Kansas upon its establishment in 1912. Currently, four U.S. Highways meet in Dodge City: U.S. Route 50, U.S. Route 56, U.S. Route 283, and U.S. Route 400. U.S. 50, an east-west route, runs through the northern part of the city. U.S. 400, which also runs east-west, runs through the southern part of the city. 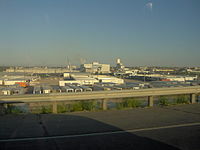 U.S. 56, an east-west route, and U.S. 283, a north-south route, run concurrently around the city's southern and eastern fringe. A U.S. 50 business route runs concurrently with U.S. 56, U.S. 283, and U.S. 400 at different points through the southern part and around the eastern part of the city. Greyhound Lines provides intercity bus service with a stop in Dodge City. The Utilities Division of the city government's Public Works Department operates and maintains the city's water and waste water distribution systems. The department's Sanitation Division provides trash pickup. Operations Management International, Inc. (OMI), a private contractor, provides waste water treatment, pumping the city's waste water to treatment holding ponds 12 miles south of the city. The Victory Electric Cooperative Association, Inc., part of the Mid-Kansas Electric Company, delivers electricity to the city. Local residents primarily use natural gas for heating fuel; natural gas service is provided by Black Hills Energy. The Dodge City Daily Globe is the city's daily newspaper with a circulation of approximately 7,000 copies. In addition, the Roman Catholic Diocese of Dodge City publishes a weekly newspaper, The Southwest Kansas Register. The High Plains Journal, a weekly trade journal covering regional agricultural news, is also published in the city. Two other annual events reflect the central role of agriculture in the local economy. The Ford County Fair is held in July and includes 4-H and FFA exhibits, competitions, and shows as well as other activities. Also in July, the Western Kansas Manufacturers Association (WKMA) holds the 3i Show, an agri-business expo of agricultural products, technology, and services. Located in and around the city are a number of historical sites, museums, and landmarks dedicated to Dodge City’s Old West heritage. The Boot Hill Museum, located downtown, contains thousands of artifacts and a variety of exhibits portraying the culture of the city’s early years. The museum’s larger exhibits include: Front Street, a partial reconstruction of downtown Dodge City as it existed in 1876; the Long Branch Saloon and the Long Branch Variety Show; the Saratoga Saloon; the Hardesty House, a period-typical home built in 1879; the city’s original Boot Hill Cemetery; and the Kansas Cowboy Hall of Fame. The Santa Fe Trail Remains, located 9 miles (14 km) west of the city, are preserved wagon tracks from a section of the Santa Fe Trail. The Ford County Historical Society maintains the Mueller-Schmidt House, called the “Home of Stone.” Built from area limestone in 1881, it is the oldest building in the city still standing at its original site. 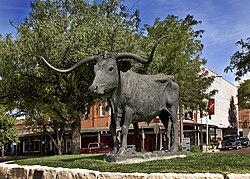 Other historical landmarks include: El Capitan, a life-sized bronze sculpture of a Texas Longhorn steer built to commemorate the cattle drives that once ended in the city; a bronze statue of famous Dodge City lawman Wyatt Earp; and the Santa Fe Depot, the largest extant train depot in Kansas. There are 33 Christian churches in and around Dodge City. The Roman Catholic Diocese of Dodge City is based in the city. Established in 1951, it comprises 28 Kansas counties, roughly the southwestern quarter of the state. The city is home to both the diocese's current and former cathedrals, Cathedral of Our Lady of Guadalupe and Sacred Heart Cathedral, respectively. Also headquartered in the city is the Dodge City District of the United Methodist Church which consists of 22 counties in southwestern Kansas. Dodge City is home to the Dodge City Law professional arena football team. The Law participate in the Champions Professional Indoor Football League. Starting in the 1870s, the violent episodes of early Dodge City history, particularly the exploits of Wyatt Earp, attracted national media attention. News coverage of the 1883 Dodge City War fueled public perceptions of frontier turmoil and established Dodge City as the “Sodom of the West” in the public consciousness. Gunfighters and lawmen such as Earp became celebrities, and sensationalized versions of their activities entered period popular culture as the subject of dime novels. Over time, the level and scale of the violence in early Dodge City were significantly embellished, becoming the stuff of legend. This trend continued into the 20th century, particularly after the 1931 publication of Stuart N. Lake’s book Wyatt Earp: Frontier Marshal. Regarded in American folklore as the quintessential rough and rowdy Old West frontier town, Dodge City served as the setting for numerous works of Western-themed media, including films and television series. Dodge City was the setting of the long-running radio and television series Gunsmoke. The series followed the adventures of fictional U.S. Marshal Matt Dillon as he dealt with gunfighters, cattle rustlers, and other criminals while enforcing the law in the city. The radio series lasted from 1952 to 1961 while the television series ran from 1955 to 1975, the longest-running prime-time TV drama in American history. The show proved culturally influential and promoted the legend of Dodge City’s Old West era. It also served as the source of the idiom “get [the hell] out of Dodge” which means to leave a dangerous area. In honor of the series, the city government changed the name of Walnut Street, one of its downtown streets, to Gunsmoke Street in 1959. The city has also been a setting for a number of films and television series dramatizing the career of Wyatt Earp. These include several seasons of the 1950s series The Life and Legend of Wyatt Earp and the films Winchester '73 (1950), Masterson of Kansas (1954), Cheyenne Autumn (1964), and Wyatt Earp (1994). The character of lawman Wade Hatton in the 1939 film Dodge City, played by Errol Flynn, was based on Earp. In the television series Smallville, Metropolis is southwest of Dodge City with Smallville, Clark Kent's childhood as well as adolescent residence 200 miles (320 km) west of Wichita. Numerous figures of the American Old West lived in Dodge City during its period as a frontier cowtown. These included, most notably, lawmen Wyatt Earp and Bat Masterson as well as gunfighter Doc Holliday. Other notable natives and residents have included Vaudeville actor and comedian Eddie Foy, Sr., wrestler Sputnik Monroe, and actor Dennis Hopper. ^ a b "Ford County Historical Society – Dodge City, Kansas". Ford County Historical Society. http://www.skyways.org/orgs/fordco/. Retrieved 2011-10-30. ^ "Administration". Dodge City, Kansas. https://en.wikipedia.org/w/index.php?title=Dodge_City,_Kansas&action=edit&section=0&summary=/*%20top%20*/%20. Retrieved 31 January 2015. ^ a b "Population Estimates". United States Census Bureau. http://www.census.gov/popest/data/cities/totals/2013/SUB-EST2013-3.html. Retrieved 2014-12-18. ^ a b "Dodge City". Encyclopædia Britannica. http://www.britannica.com/EBchecked/topic/167590/Dodge-City. Retrieved 2010-05-08. ^ "Will Soule: Scalped Hunter Near Fort Dodge, Kansas". The American Museum of Photography. http://www.photographymuseum.com/soulelg.html. Retrieved 2010-05-08. ^ Smith, Jessica (2013). "Morality and Money: A Look at how the Respectable Community Battled the Sporting Community over Prostitution in Kansas Cowtowns, 1867–1885". Kansas State University. http://krex.k-state.edu/dspace/bitstream/handle/2097/15686/JessicaSmith2013.pdf. ^ a b "2003-2004 Official Transportation Map". Kansas Department of Transportation. 2003. http://www.ksdot.org/burtransplan/maps/HistoricStateMaps/2003-04Mapside.pdf. Retrieved 2011-10-16. ^ "High Plains / Ogallala Aquifer Information". University of Kansas – Kansas Geological Survey. http://www.kgs.ku.edu/HighPlains/index.shtml. Retrieved 2011-10-16. ^ "City Distance Tool". Geobytes. http://www.geobytes.com/citydistancetool.htm. Retrieved 2010-05-08. ^ a b c "Major Employers". Dodge City Development Corporation. http://www.dodgedev.org/community-profile/major-employers/. Retrieved 2010-06-19. ^ "Attractions". Dodge City Convention & Visitors Bureau. http://www.visitdodgecity.org/index.aspx?nid=59. Retrieved 2010-06-19. ^ "Existing Industry". http://www.dodgedev.org/doing-business/existing-industry. Retrieved 6 February 2015. ^ a b "Dodge City, Kansas". City-Data. http://www.city-data.com/city/Dodge-City-Kansas.html. Retrieved 2011-10-29. ^ a b c "Dodge City". Directory of Kansas Public Officials. The League of Kansas Municipalities. http://www.lkm.org/directory/cities.php?ID=100. Retrieved 2011-10-22. ^ "Dodge City Commission". City of Dodge City, Kansas. http://www.dodgecity.org/index.aspx?nid=54. Retrieved 2010-06-19. ^ "City Manager's Office". City of Dodge City, Kansas. http://www.dodgecity.org/index.aspx?NID=85. Retrieved 2010-06-19. ^ "Ford County Directory". Ford County, Kansas. http://www.fordcounty.net/contactus.html. Retrieved 2012-07-02. ^ "District". Dodge City Public Schools. http://www.usd443.org/district.cfm. Retrieved 2011-10-28. ^ "Sacred Heart Cathedral School, Dodge City". Roman Catholic Diocese of Dodge City. http://www.dcdiocese.org/catholic-schools/sacred-heart-cathedral-school-dodge-city. Retrieved 2011-09-18. ^ "Dodge City Community College and Area Technical Center – 2011–2012 Catalog". Dodge City Community College. http://www.dc3.edu/catalog/current_catalog.pdf. Retrieved 2011-09-18. ^ "Frequently Asked Questions". Dodge City Community College. http://www.dc3.edu/admissions/. Retrieved 2011-09-18. ^ "St. Mary of the Plains Academy, High School and College". St. Mary of the Plains Alumni Association. http://www.stmaryoftheplainsalumniassociation.org/class_index.cfm. Retrieved 2011-09-18. ^ "Western Kansas". Newman University. http://www.newmanu.edu/western-kansas. Retrieved 2011-09-18. ^ "Dodge City Public Library – Dodge City, KS". lib-web-cats - A directory of libraries throughout the world. http://www.librarytechnology.org/lwc-displaylibrary.pl?RC=3959. Retrieved 2011-09-23. ^ "About DCPL". Dodge City Public Library. http://www.dcpl.info/about.htm. Retrieved 2011-09-23. ^ "Public Services". Dodge City Public Library. http://www.dcpl.info/publicservices.htm. Retrieved 2011-09-23. ^ "Facilities". Dodge City Community College. http://www.dc3.edu/handbook/facilities.htm. Retrieved 2011-09-23. ^ "GPO Federal Library Directory". United States Government Printing Office. http://catalog.gpo.gov/fdlpdir/FDLPdir.jsp?flag=searchp&st_12=KS. Retrieved 2011-09-23. ^ "About the Kansas Heritage Center". Kansas Heritage Center. http://ksheritagestore.org/about_the_center.html. Retrieved 2011-10-10. ^ Weingroff, Richard F.. "The National Old Trails Road Part 1: The Quest for a National Road". Federal Highway Administration. pp. 20–21. http://www.fhwa.dot.gov/infrastructure/trails.pdf. Retrieved 2011-10-16. ^ a b "City of Dodge City (Map)". Kansas Department of Transportation. Apr 2009. http://www.ksdot.org/burtransplan/maps/city-pdf/dodge%20city.pdf. Retrieved 2011-10-16. ^ "Locations : States : Kansas". Greyhound Lines. http://www.greyhound.com/en/locations/locations.aspx?state=ks. Retrieved 2011-10-16. ^ a b "General Highway Map – Ford County, Kansas". Kansas Department of Transportation. 2010-06-01. http://www.ksdot.org/burtransplan/maps/county-pdf/ford.PDF. Retrieved 2011-10-16. ^ "KDDC – Dodge City Regional Airport". AirNav.com. http://www.airnav.com/airport/KDDC. Retrieved 2011-10-16. ^ "Transportation". Dodge City Convention and Visitors Bureau. http://www.visitdodgecity.org/index.aspx?nid=65. Retrieved 2011-10-16. ^ "Kansas Operating Division". BNSF Railway. 2009-04-01. http://www.bnsf.com/customers/pdf/maps/div_ks.pdf. Retrieved 2011-10-16. ^ "Southwest Chief". Amtrak. http://www.amtrak.com/servlet/ContentServer?c=AM_Route_C&pagename=am%2FLayout&p=1237405732511&cid=1241245650447. Retrieved 2011-10-16. ^ "Dodge City, KS (DDG)". Amtrak. http://www.amtrak.com/servlet/ContentServer?c=am2Station&pagename=am%2Fam2Station%2FStation_Page&cid=1229726270582. Retrieved 2011-10-16. ^ "Utilities Division". City of Dodge City, Kansas. http://www.dc3.edu/sports/index.htm. Retrieved 2011-10-29. ^ "Sanitation Division". City of Dodge City, Kansas. http://www.dodgecity.org/index.aspx?NID=112. Retrieved 2011-10-29. ^ "Wastewater Treatment Division". City of Dodge City, Kansas. http://www.dodgecity.org/index.aspx?NID=114. Retrieved 2011-10-29. ^ "About Us". Victory Electric Cooperative Association, Inc.. http://www.victoryelectric.net/about_us.html. Retrieved 2011-10-29. ^ "About Us". Mid-Kansas Electric Company, LLC. http://www.midkansaselectric.net/. Retrieved 2011-10-29. ^ "Black Hills Corporation to Acquire Aquila's Gas Utility Operations in Kansas". Black Hills Energy. 2007-02-07. http://www.blackhillscorp.com/ir/bhc/020607KS.pdf. Retrieved 2011-10-29. ^ "Western Plains Medical Center & Our Community". Western Plains Medical Complex. http://www.westernplainsmc.com/CustomPage.asp?guidCustomContentID=89AFDF48-0FF2-4CEA-91DD-8E12876C633E. Retrieved 2011-10-29. ^ "Dodge City Daily Globe". Mondo Times. http://www.mondotimes.com/1/world/us/16/907/2363. Retrieved 2011-10-23. ^ "About this Newspaper: The Southwest Kansas register". Chronicling America. Library of Congress. http://chroniclingamerica.loc.gov/lccn/sn78003977/. Retrieved 2009-09-27. ^ "High Plains Journal". Mondo Times. http://www.mondotimes.com/1/world/us/16/907/19487. Retrieved 2011-10-23. ^ a b "Radio Stations in Dodge City, Kansas". Radio-Locator. http://www.radio-locator.com/cgi-bin/locate?select=city&city=Dodge+City&state=KS&x=0&y=0. Retrieved 2011-10-23. ^ "Stations for Garden City, Kansas". RabbitEars.Info. http://www.rabbitears.info/market.php?request=print_market&mktid=86. Retrieved 2011-10-23. ^ a b "TVQ TV Database Query". Federal Communications Commission. http://www.fcc.gov/fcc-bin/audio/tvq.html. Retrieved 2013-07-01. ^ a b "About Us". KWCH-DT. http://www.kwch.com/about/kwch-about-us,0,4740020.story. Retrieved 2011-05-28. ^ "TV Market Maps". EchoStar Knowledge Base. http://dishuser.org/TVMarkets/. Retrieved 2011-05-28. ^ "KSAS Coverage Map". KSAS-TV. http://www.foxkansas.com/sites/ksas/content/about_us/contact_us/coverage-map-2009.pdf. Retrieved 2011-05-28. ^ "History". Smoky Hills Public Television. http://www.shptv.org/index.php/component/content/article/28-history/32-history. Retrieved 2011-05-27. ^ "TV23 KDGL-TV – Coverage". Kdgltv.com. http://www.kdgltv.com/coverage.htm. Retrieved 2013-07-15. ^ a b "City Parks Map". City of Dodge City, Kansas. http://www.dodgecity.org/index.aspx?NID=144. Retrieved 2011-10-28. ^ "Wright Park Zoo". City of Dodge City, Kansas. http://www.dodgecity.org/index.aspx?NID=106. Retrieved 2011-10-28. ^ "Legends Park". City of Dodge City, Kansas. http://www.dodgecity.org/index.aspx?nid=101. Retrieved 2011-10-28. ^ "St. Mary Soccer Complex". City of Dodge City, Kansas. http://www.dodgecity.org/index.aspx?NID=489. Retrieved 2011-10-28. ^ "Municipal Pool". Dodge City Convention and Visitors Bureau. http://www.visitdodgecity.org/index.aspx?nid=137. Retrieved 2011-10-28. ^ "Golf Resources". Dodge City Convention and Visitors Bureau. http://www.visitdodgecity.org/index.aspx?nid=72. Retrieved 2011-10-28. ^ "About Carnegie Arts Center". Dodge City Convention and Visitors Bureau. http://www.visitdodgecity.org/index.aspx?NID=79. Retrieved 2011-09-25. ^ "Carnegie Center History". The Carnegie Center for the Arts. http://www.dodgecityarts.org/history.html. Retrieved 2011-09-25. ^ "Second Avenue Art Guild". Dodge City Convention and Visitors Bureau. http://www.visitdodgecity.org/index.aspx?NID=245. Retrieved 2011-09-25. ^ "About the Company". The Depot Theater Company. http://www.depottheaterco.com/cms/index.php?page=about-the-company. Retrieved 2011-09-25. ^ "Dodge City Days History". Dodge City Area Chamber of Commerce. http://www.dodgecitydays.com/history.html. Retrieved 2011-09-25. ^ "Events". Dodge City Area Chamber of Commerce. http://www.dodgecitydays.com/events.html. Retrieved 2011-09-25. ^ a b "2011 Annual Events Calendar". Dodge City Convention and Visitors Bureau. http://www.visitdodgecity.org/documents/Events/2011%20Calendar%20of%20events.JPG. Retrieved 2011-09-25. ^ Perez, Candy (2011-05-06). "Cinco de Mayo Celebration at Wright Park". Dodge City Daily Globe. http://www.dodgeglobe.com/news/local/x242751499/Cinco-de-Mayo-Celebration-at-Wright-Park. Retrieved 2011-10-08. ^ "Old Fashioned Fourth of July". Dodge City Convention and Visitors Bureau. http://www.visitdodgecity.org/index.aspx?nid=99. Retrieved 2011-10-08. ^ "Christmas in Old Dodge City". Dodge City Convention and Visitors Bureau. http://www.visitdodgecity.org/index.aspx?nid=101. Retrieved 2011-10-08. ^ "2011 Fair Schedule". Ford County K-State Research and Extension. http://www.ford.ksu.edu/DesktopModules/ViewDocument.aspx?DocumentID=31533. Retrieved 2011-10-08. ^ "3i Show". Western Kansas Manufacturers Association. http://www.3ishow.com/3i/default.htm. Retrieved 2011-09-25. ^ "Live the Legend of the West at Boot Hill Museum". Boot Hill Museum. 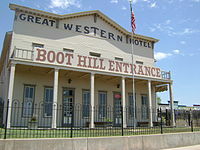 http://boothill.org/live-the-legend-of-the-west-at-boot-hill-museum/. Retrieved 2011-10-09. ^ a b "Boot Hill Museum Exhibits". Boot Hill Museum. http://boothill.org/about/. Retrieved 2011-10-09. ^ "The Mueller-Schmidt House (1881) Museum". Ford County Historical Society. http://www.skyways.org/orgs/fordco/house.html. Retrieved 2011-10-09. ^ "Other Dodge City Sites of Interest". Dodge City Convention and Visitors Bureau. http://www.visitdodgecity.org/index.aspx?NID=154. Retrieved 2011-10-09. ^ Hanks, Kathy (2010-10-08). "Car crash damages Dodge City longhorn statue El Capitan". Lawrence Journal-World. http://www2.ljworld.com/news/2010/oct/08/car-crash-damages-longhorn-statue/. Retrieved 2011-10-09. ^ "Historic Downtown Dodge City". Dodge City Convention and Visitors Bureau. http://www.visitdodgecity.org/index.aspx?NID=246. Retrieved 2011-10-09. ^ "Historic Trolley Tours". Dodge City Convention and Visitors Bureau. http://www.visitdodgecity.org/index.aspx?NID=91. Retrieved 2011-10-09. ^ "Dodge City Trail of Fame". The Dodge City Trail of Fame, Inc.. http://www.dodgecitytrailoffame.org/cms/. Retrieved 2011-10-09. ^ "About Us". Boot Hill Casino & Resort. http://www.boothillcasino.com/about_us.php. Retrieved 2011-10-09. ^ Stephens, Ken (December 16, 2009). "Dodge casino opens doors". Garden City Telegram: p. 1. http://www.newspapers.com/clip/852202//. Retrieved August 12, 2014. ^ "Civic Center". City of Dodge City. http://dodgecity.org/index.aspx?nid=493. Retrieved 2011-10-10. ^ "Dodge City Civic Center". City of Dodge City. http://dodgecity.org/index.aspx?nid=103. Retrieved 2011-10-10. ^ "United Wireless Arena". VenuWorks. http://unitedwirelessarena.com/. Retrieved 2011-10-10. ^ "Dodge City Zoo". Dodge City Convention and Visitors Bureau. http://www.visitdodgecity.org/index.aspx?NID=83. Retrieved 2011-10-10. ^ "Kansas Teachers' Hall of Fame". Dodge City Convention and Visitors Bureau. http://www.visitdodgecity.org/index.aspx?NID=86. Retrieved 2011-10-10. ^ "Find a Church in Dodge City, KS". Patheos. http://www.patheos.com/directory/church/KS/Dodge_City. Retrieved 2011-10-29. ^ "History". Roman Catholic Diocese of Dodge City. http://www.dcdiocese.org/about-us-diocese/history. Retrieved 2011-10-29. ^ "Cathedral of Our Lady of Guadalupe". Cathedral of Our Lady of Guadalupe. http://dodgecitycathedral.com/home/cathedral-history. Retrieved 2011-10-29. ^ "Welcome to Dodge City District". The Dodge City District of the United Methodist Church. http://www.kswestumc.org/dsite.asp?dv=2. Retrieved 2011-10-29. ^ "Dodge City Community College Conquistador Athletics". Dodge City Community College. http://www.dc3.edu/sports/index.htm. Retrieved 2011-10-22. ^ "Dodge City Athletics". Dodge City Athletics. http://www.dodgecityas.com/. Retrieved 2011-10-23. ^ "Cavalier Field". City of Dodge City, Kansas. http://www.dodgecity.org/index.aspx?nid=499. Retrieved 2011-10-28. ^ "Dodge City Raceway Park". Dodge City Convention and Visitors Bureau. http://www.visitdodgecity.org/index.aspx?nid=81. Retrieved 2011-10-23. ^ "Western Kansas Dirt Riders – 2010 Schedule". Western Kansas Dirt Riders. http://www.wkdr.net/2010.htm. Retrieved 2011-10-23. ^ "Dodge City Legend News". Dodge City Legend. http://www.dodgecitylegend.com/news.html. Retrieved 2011-10-23. ^ Ellis, Mark R.. "Frontier Violence". Encyclopedia of the Great Plains. University of Nebraska-Lincoln. http://plainshumanities.unl.edu/encyclopedia/doc/egp.ii.026. Retrieved 2011-10-12. ^ "Gunsmoke". IMDb. http://www.imdb.com/title/tt0047736/. Retrieved 2011-10-12. ^ "Gunsmoke (1955) – Trivia". IMDb. http://www.imdb.com/title/tt0047736/trivia. Retrieved 2011-10-12. ^ Dykstra, Robert R.. "Dodge City, Kansas". Encyclopedia of the Great Plains. University of Nebraska-Lincoln. http://plainshumanities.unl.edu/encyclopedia/doc/egp.ii.019. Retrieved 2011-10-12. ^ Reagan, Mark (2011-06-04). "Remembering James Arness". Dodge City Daily Globe. http://www.dodgeglobe.com/news/x907623243/Remembering-James-Arness. Retrieved 2011-10-12. ^ "The Life and Legend of Wyatt Earp (1955) – Trivia". IMDb. http://www.imdb.com/title/tt0047750/trivia. Retrieved 2011-10-14. ^ Mann, Anthony (director). 'Winchester ‘73' [Film]. U.S.A.: Universal Studios. ^ Castle, William (director). 'Masterson of Kansas' [Film]. U.S.A.: Columbia Pictures. ^ Ford, John (director). 'Cheyenne Autumn' [Film]. U.S.A.: Warner Bros..
^ Kasdan, Lawrence (director). 'Wyatt Earp' [Film]. U.S.A.: Warner Bros..
^ "Photo Gallery: Wyatt Earp in Popular Culture". American Experience. PBS. http://www.pbs.org/wgbh/americanexperience/features/photo-gallery/wyatt/. Retrieved 2011-10-16. ^ Kasavin, Greg (2005-11-08). "Gun Review". Gamespot. http://www.gamespot.com/xbox/action/gun/review.html?tag=summary%3Bread-review. Retrieved 2011-10-16. ^ "More Dodge City History". Dodge City Convention and Visitors Bureau. http://www.visitdodgecity.org/index.aspx?NID=106. Retrieved 2011-09-23. ^ "Eddie Foy – Biography". IMDB. http://www.imdb.com/name/nm0289386/bio. Retrieved 2011-09-23. ^ "Sputnik Monroe Biography". Georgia Wrestling History. http://www.georgiawrestlinghistory.com/host/monroes/sputnik.html. Retrieved 2011-09-23. ^ "Dennis Hopper – Biography". IMDB. http://www.imdb.com/name/nm0000454/bio. Retrieved 2011-09-23. (October 1, 2003) "'Boot Hill Burlesque': The Frontier Cemetery as Tourist Attraction in Tombstone, Arizona, and Dodge City, Kansas". Journal of Arizona History. This page uses content from the English language Wikipedia. The original content was at Dodge City, Kansas. The list of authors can be seen in the page history. As with this Familypedia wiki, the content of Wikipedia is available under the Creative Commons License.